Our field of vision normally has a focal area in which visual awareness is concentrated. Around this lies a border area, the periphery, in which we register certain objects but do not see them as clearly as what is in focus. So it is, too, with inner awareness. Some things are in the centre of awareness while others are peripheral. In this article we consider how various inner situations in meditation can be understood in these terms. Before we discuss the principles of correct meditation, we shall first observe that thoughts arise in meditation, and that they may arise in either the centre or the border area of our awareness. Correspondingly, the meditation sound can be repeated in the centre or the periphery. Often the meditation sound will be repeated freely and effortlessly in the centre of awareness while thoughts pass unhindered in the border area. At other times, however, it may be different. Situations such as these are illustrated in the figures below. The innermost circle indicates the centre of awareness and the grey circle around it shows the border area. “T” signifies thoughts. Lower-case “m” stands for the meditation sound when it is repeated in a free, light manner, while upper-case “M” is the meditation sound repeated in a more forceful and concentrated way. Figure a illustrates a situation in which the meditation sound is repeated effortlessly in the border area while the centre of awareness dwells on thoughts. In this unfocused way of meditating, thoughts are dominant. The meditation sound can only to a limited extent establish a free, accepting openness, and this enables relatively little working through of unprocessed impressions. In Figure b we concentrate on the meditation sound at the centre of awareness and repeat it with effort. However, repeating the meditation sound in this way actively keeps thoughts at a distance. The cross over the ‘T’ in the figure indicates that there is no room for both the meditation sound and the thoughts: the sound displaces or suppresses the thoughts. Meditating in this way does not provide freedom for thoughts to be finished, and there is no opportunity for underlying tension to be worked through. In Figure c we place the meditation sound in the centre of awareness, but we repeat it in a light and soft manner. At the same time, we let thoughts pass unhindered in the border area. This is the situation we in Acem think of as meditating with a free mental attitude. When we meditate with a free mental attitude, we often discover that our thoughts have moved into the centre of awareness, and we have become completely absorbed by them. We are, in Acem’s terminology, “spontaneously concentrated”, indicating that we have lost our free mental attitude. When we realise that the meditation sound has slid out of focus in this way, we place it back in the centre of awareness and repeat it lightly and softly. As an example, let us look more closely at a situation that might induce the unfocused meditation illustrated in Figure a. From time to time thoughts will arise which have an emotionally charged content. Such thoughts are captivating, fascinating, absorbing – thoughts we like to think. Thoughts like these tend to influence our meditation performance. We know that we should go back to repeating the meditation sound, but it is easy to make the mistake of only doing so “halfheartedly”, while allowing our thoughts to go on occupying the centre of awareness. By giving the meditation sound so little attention, we can continue our interesting reverie almost undisturbed. This is the situation illustrated in Figure a. There may be several reasons why we choose to meditate in this manner. Perhaps we have convinced ourselves that this is the right way: we have followed the instruction by repeating the sound without concentrating, and the only alternative would be to concentrate and interfere with the natural flow of the mind, which we are not supposed to do. However, this is usually not a satisfactory way of practising meditation. The thoughts, and the needs they flow from, continue to dominate our awareness, which means we cannot liberate ourselves from them. What we should do when interesting and absorbing thoughts arise is normally to make a transition to Figure c by thinking the meditation sound lightly and softly and placing it in the centre of awareness. At the same time we should accept that emotionally charged thoughts may arise quite often, and we may need to place the meditation sound without effort in the centre of awareness many times and resume repeating it . This should not prevent us from repeating it in a light and free manner, with our awareness directed towards the sound. 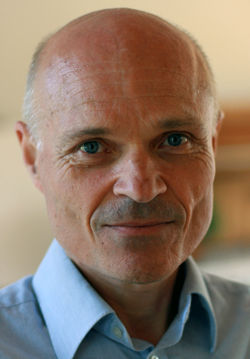 Tor Hersoug, PhD, is Director of Economic Research in The Confederation of Norwegian Business and Industry, and an initiator in Acem International School of Meditation. To give a new name to an ancient practice is mischievous in the eyes of cognisanti and misleading for the ignorant. Acem has nothing new to offer in terms of technique, philosophy or the results. Various schools of thought in meditation practice teach that meditation should be done with a relaxed and free mental and physical attitude. Suppression of thoughts is never emphasized. In real Indian meditation, one can focus centrally or peripherally, clearly or opaquely, continuously or intermittently, as an insider or as an outsider, with or without sound, with or without light, with or without taste/smell/touch perceptions, and in a thousand other different ways! The results vary, but consistently include a number of criteria that are always positively improved. The so called Acem technique is nothing new! Indians know it well. It is just a small facet of a thousand facet finely cut diamond, so to speak! You may look at the diamond through any facet, it shines! What you Acem people are doing is calling your facet a separate diamond! You could not be farther from the truth. But, at least you are looking at the diamond … And thats good!